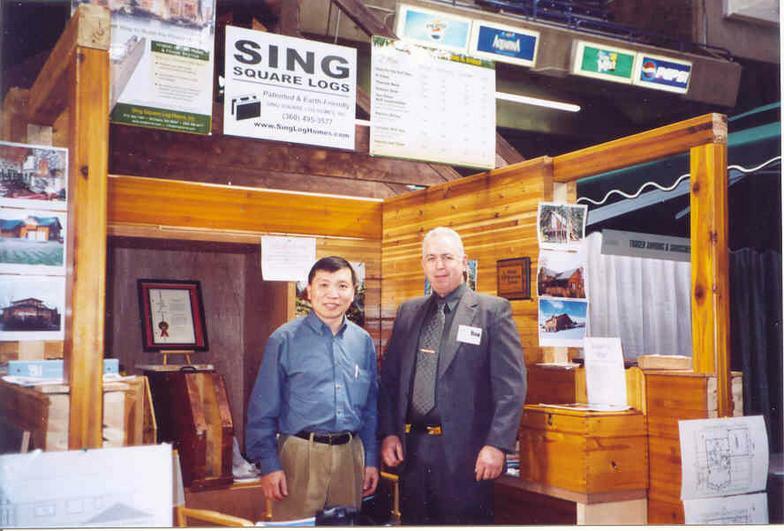 Peter Sing, inventor & owner of Sing Square Log Homes and Chuck Dudley, owner of Pioneer Home Services. Tacoma, WA Home Show 2004. 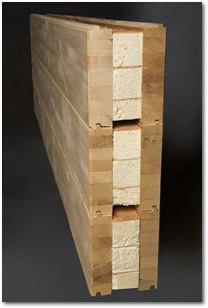 Patented, double-wall square logs made from quarter-sawn, all vertical grain solid timber. The Sing square Log is the heart and soul of this building system. With the patented quarter sawing process, this double-wall, double tongue-and-groove square log assembly has all the advantages that conventional log construction has to offer, but with none of its associated shortcomings and idiosyncrasies. The Sing Square Log's thick double wall provides the thermal mass to absorb, store and slowly release heat over time. This means that it takes a long time for temperature outside a Sing Log Home to change the temperature inside. Temperature swings and sudden loss of warm or cool air are minimized. The result is a comfortable indoor environment all year around. The thermal mass effect also benefits the house's energy efficiency, as the heating and cooling equipment does not need to run as often. 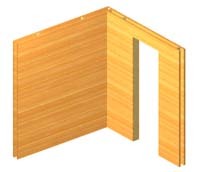 The Sing Square log wall has five inch thick, all straight or vertical grain solid wood (two and one half inch on each side), plus a three inch dead air space to provide a warm, natural, comfortable and energy efficient building envelope, yet at the same time it is strong, dimensionally stable (virtually no shrinking, cracking or checking) and easy to build. In fact, we'd like to think the Sing Square log system has gone beyond the limit of log construction. It is simply a better way to build a better home. One engineer has stated that this system is designed to last 400 years! That's twice as long as any traditional log home has survived in this country. We don't just build homes, we build family legacies. Just imagine your descendants saying some day, "My Great-Great-Great-Great grandparents built this house." At one time, Sing Logs were made hollow (as seen above & at right), with the option of pouring expandable foam insulation in them during construction. 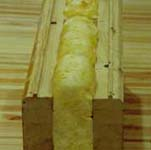 The R-value of a hollow log was R-26, which exceeded the Code requirement of R-21. Currently, Sing Logs are pre-insulated with a patented rigid foam & panel strip honeycomb system. The R-value of these logs is R-36, far exceeding any Code requirement. Sing Homes are many times stronger than conventional frame homes. R-19 to R-21 insulation required by Washington State Energy Code. Sing log wall assembly - solid & substantial. 3" R-36 rigid foam honeycomb insulation. Surpasses Washington State Energy Code requirements. Horizontal space provided for electrical wiring. 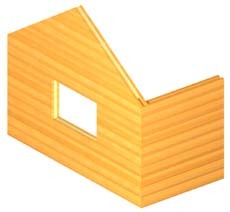 All Sing Home building products are manufactured with untreated, natural wood and non-toxic glue. They replace many conventional building materials that often contain toxic chemicals or obnoxious gas fumes. As more and more people are suffering from asthma, allergies and indoor air quality related health issues, Sing Log Homes have clearly become a preferred choice. 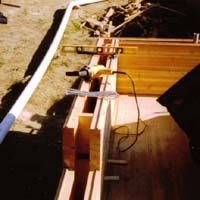 The patented quarter sawing technique allows us to make use of lumbers rejected by regular lumber mills. these otherwise fine lumbers are often considered unusable or"defective" by other mills because they are too small in diameter and/or contain wanes. Instead of heading to the chippers, they are salvaged and turned into the remarkable building blocks for your fine home. All Sing Home building products maximize the strength and function of natural wood fiber with less consumption of energy during the manufacturing process. Sing home building products are also longer lasting than other materials commonly used in housing projects -- less waste to the landfill. 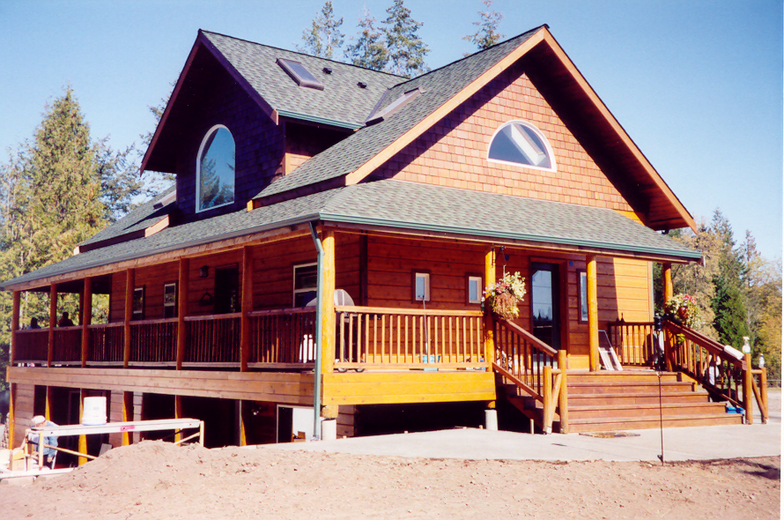 It is very difficult for average log homes to exceed 8 feet in height due to the settling problem. Sing Homes often reach beyond 30 feet high. Think of Sing Logs as Lego blocks -- your imagination is the limit! Sing Home has the most variety of styles and can be built to any set of plans. This home on Beacon Hill in Seattle, WA, was owner/contractor built, and illustrates the extremes in which a Sing Home can be taken. Sing Home has eliminated many conventional building processes and materials; such as exterior siding, vapor barrier, sheathing, framing lumber, batt insulation and drywall -- less labor and less material. Sing Homes on the average are assessed at more than 20% higher than the average frame home of equivalent size. Entire exterior wall made of 8"x10" Sing Square Logs. Requires no additional siding, sheathing, or house wrap on the exterior. 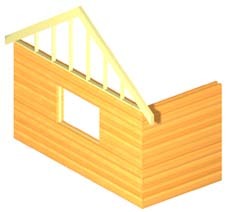 Sing Log wall combined with 2x framing, typically for gable ends, dormers, etc. 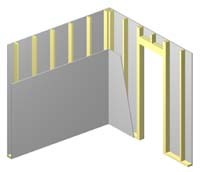 Requires conventional build-up method for the framed portion. Entire interior wall made of 4"x10" or 6"x10" Sing Square Logs. High thermal mass and noise isolation for maximum comfort. Best match for exterior Sing Log wall's look & feel. Sing paneling on 2x framing. Conventional framing flexibility with Sing Log look. Different materials can be used on each side of wall. 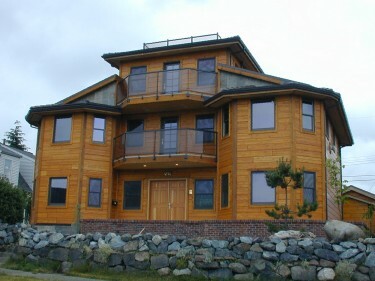 Sing Log Homes are solid and substantial homes. They need "solid" flooring to compliment them. Sing Flooring is manufactured from laminating quarter-sawn (vertical grain) solid wood strips. Quarter-sawn lumber offers superior strength and dimensional stability over flat-sawn lumber. Sing Flooring virtually will not warp, sag or squeak. Unlike any other solid or engineered wood flooring, Sing Flooring is versatile due to its strength, dimensional stability and unparalleled water resistance. Now you can have beautiful hard wood floor anywhere in the house - even in bathrooms. During our tests, a section of flooring was placed outside and subjected to direct sun, rain, snow, sleet & ice for 5 years. A light sanding brought it back to its original beauty, with no separation of laminations and no twisting, cupping or splitting. No formaldehyde or other toxic chemicals are used during Sing Flooring's manufacturing. Now you can enjoy wood as a healthy natural resource. Sing Flooring is also a environmentally friendly and sustainable wood product, since it can be manufactured from much smaller lumber. Sing Flooring is comfortable to walk on. The plank's extra thick "soft" wood construction makes it quieter and less tymmpanic than most hard wood flooring. Sing Flooring also offers more thermal mass than regular thinner flooring materials. The ability to retain and slowly release heat gives Sing Flooring a warm feel and also makes it an ideal wood floor for radiant floor heating. Sing Flooring is one of the widest (9-1/2") and longest (up to 16') solid wood flooring materials on the market. This translates to less labor and fewer seams.